8 pp. Roman, 399 pp. Bensen üliger (booklet stories) are a literary genre representing the orally passed on modern Spielmannsdichtung of Inner Mongolia originally emanating from written templates. The latter are mostly Chinese novels or heroic stories for which a Mongolian translation exists in most cases. Bensen üliger are told by minstrels (Mong. : quγurči) from eastern and southeastern Mongolia until today. The bensen üliger Ögedei mergen qaγan-u üliger (“The story of wise Qaγan Ögedei”) under research is part of a collection of tape transcripts of Mongolian folk literature texts from the estate of Prof. Dr. Walther Heissig, who bequeathed these transcripts to the Nordrhein-West­fälische Akademie der Wissenschaften und Künste at Düsseldorf. A large part of this text collec­tion has not yet been edited or translated. The story line of the present booklet story takes place during the time of Yuán dynasty and was recorded in autumn of 1980 with a recording time of about 60 hours. 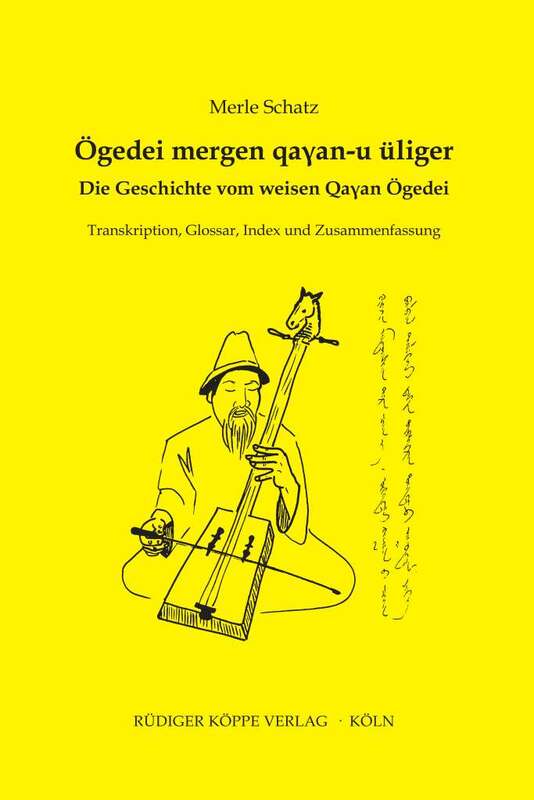 This book contains the Uiguro-Mongolian transcription of the bensen üliger Ögedei mergen qaγan-u üliger after Poppe’s (2006) system. The formal setup of the transcription is equivalent to the handwritten template. In the booklet story Ögedei mergen qaγan-u üliger, the author noticed specific phenomena of language contact which are of particular importance for the present study. It turned out that the Mongols from Inner Mongolia who grew up bilingually, depending on the region, use Chinese and Mongolian alternately or in mixed form. In the latter, they modify the Chinese language significantly. The use of language in specific functions (diglossia) in Inner Mongolia and the bilingualism (Mongolian, Chinese) of the Mongols leads to code-switching and, linked to that, to various linguistic transfer phenomena. These are measurable in the areas of the lexicon, phon­etics, and morphology. Due to the fact that the bensen üliger are orally passed on modern Spielmannsdichtung, they contain elements of vernacular, like sinisms (the Mongolian reproduc­tion of Chinese words and concepts). So the sinisms of this volume are evidence for the phe­nomena of language contact in Inner Mongolia and for the fact that these have found their way into the repertory of Mongolian oral tradition. Merle Schatz kommt der Verdienst zu, die sehr schwierige Rekonstruktion möglicher chinesischer Entsprechungen der in der Abschrift enthaltenen Sinismen in Angriff genommen zu haben. Zusätzlich erschwert wurde die Rekonstruktion durch eine Reihe von Begriffen und Namen, die von dem quyurci selbst erfunden worden waren. Die Autorin hat zur Rekonstruktion auf die Hilfe mongolischer Informantinnen und Informanten zurückgegriffen, wie überhaupt diese Arbeit in enger Zusammenarbeit mit innermongolischen Wissenschaftlern (besonders Professor Nima) zustande gekommen ist. [...] Die von Merle Schatz angefertigte Transkription des handschriftlichen Textes und die beigefügte Zusammenfassung des Inhalts sind nicht nur für die Mongolistik von Bedeutung, sondern auch für die literaturwissenschaftliche Komparatistik. Die erfassten Sinismen wiederum bieten gerade für die linguistische Erfassung von Sprachkontakterscheinungen interessante Daten. Sehr zu loben ist die methodische Vorgehensweise der Autorin, die Feldforschung mit philologischer Expertise verbindet. Für Mongolisten ist diese Publikation sehr zu begrüßen. Sie ist wieder ein Mosaikstein, der dazu dient, eine Lücke in unseren spärlichen Kenntnissen der mongolischen Volksgeschichtsliteratur zu füllen. Merle Schatz sei dafür gedankt, uns diesen Text aufbereitet zu haben.